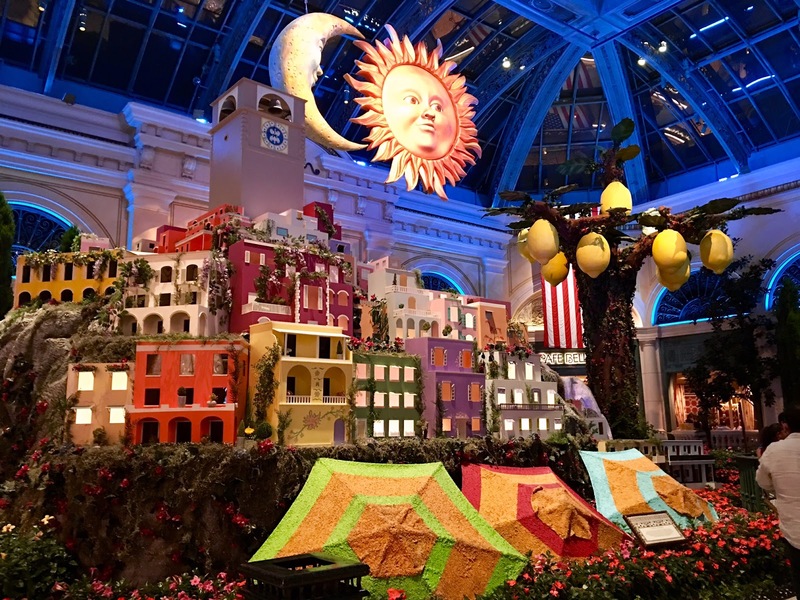 While I've been to Vegas several times and have dined at the Bellagio, I had never stayed the night there. I normally tend to stay at the MGM or the Luxor depending on the reason for visiting (for EDC or just to visit). 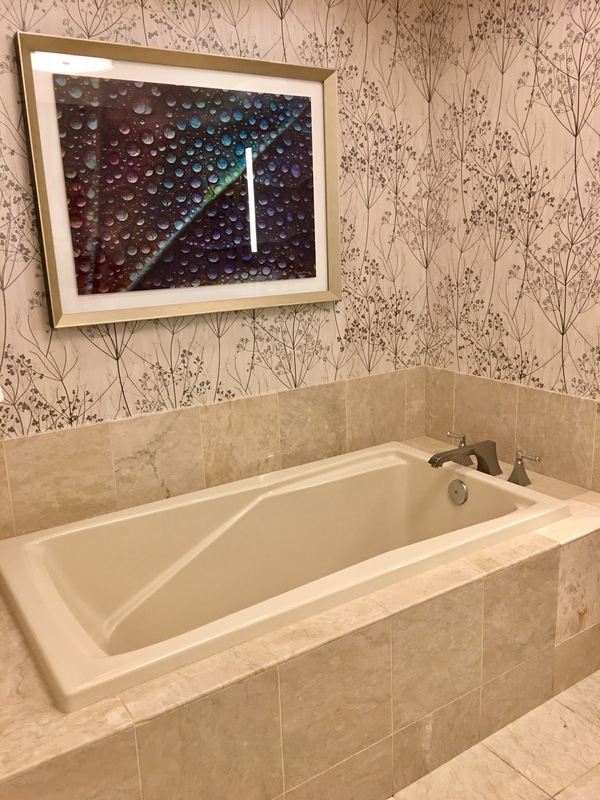 Thankfully I live in Los Angeles where it's a short drive (4-5 hours) so when I saw an amazing deal to stay at the normally expensive Bellagio, I went for it with only a week's notice. 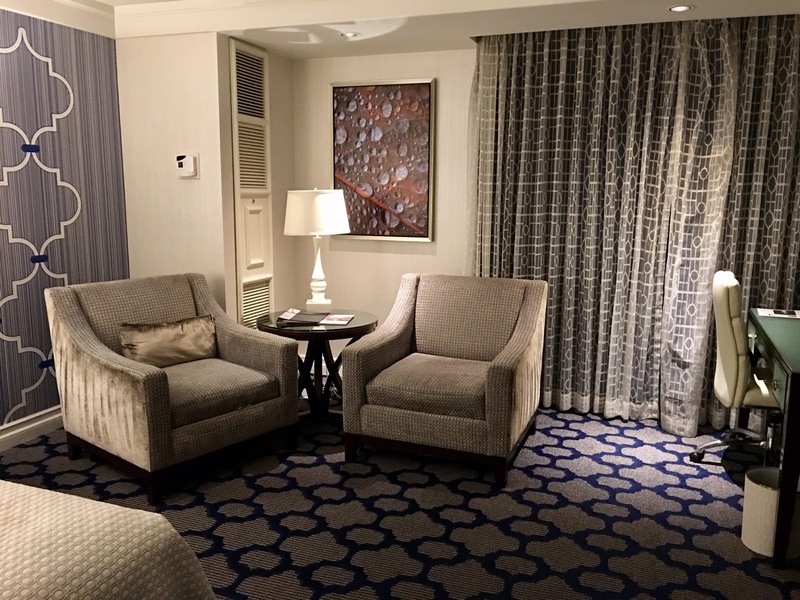 I truly was looking forward to the stay aspect of experiencing the Bellagio and they did not disappoint. Here's my full review! Room: Our room at the Bellagio was the Resort King, which I believe is their standard room. 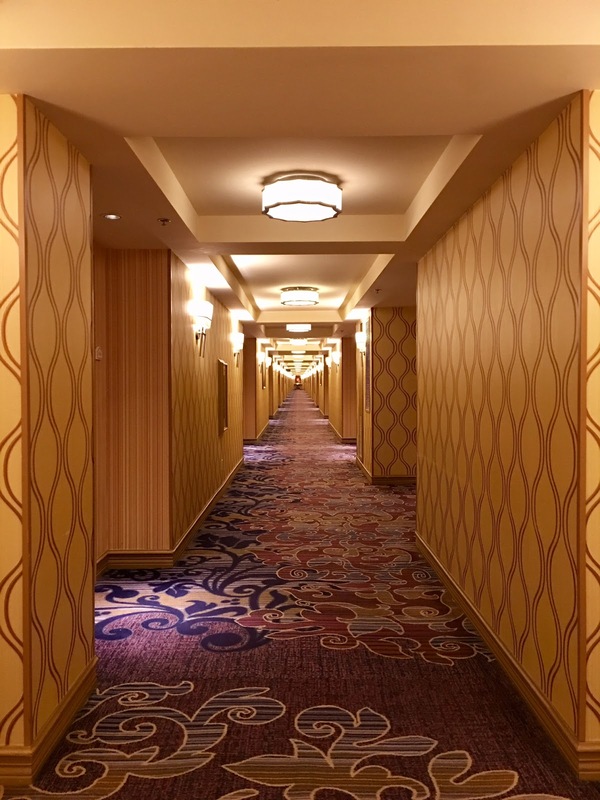 The hallway and floor was extremely quiet both day and night, which I appreciated. 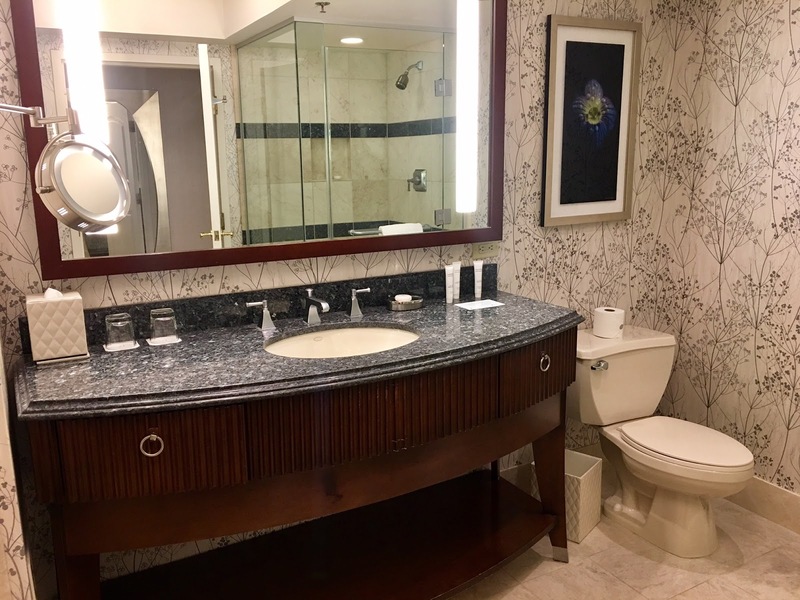 I was surprised to see there were no in-room service trays outside the rooms and absolutely no trash. 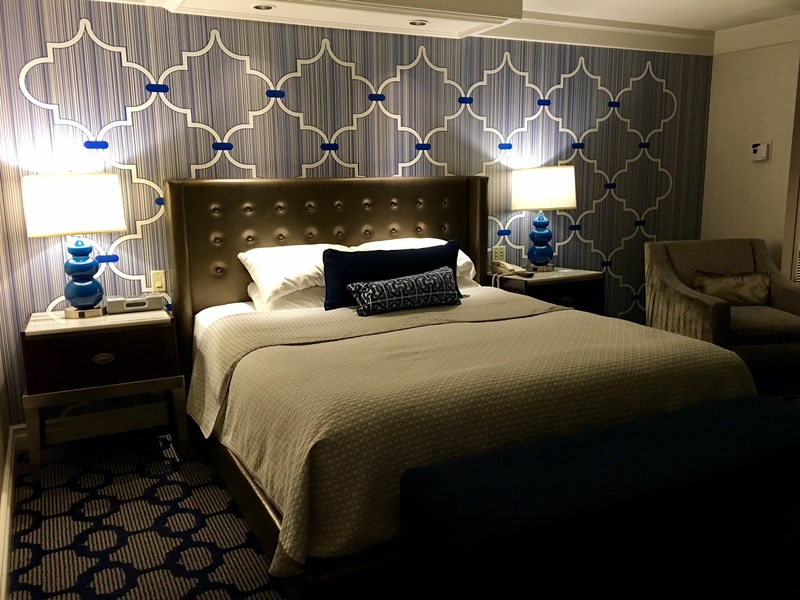 I absolutely loved the wallpaper and stunning decor throughout the room. The striking blue and soft grays complemented each other so well - definitely home decor inspo! I say this a lot in my other hotel reviews but I truly appreciate hotels that have plenty of accessible outlets. 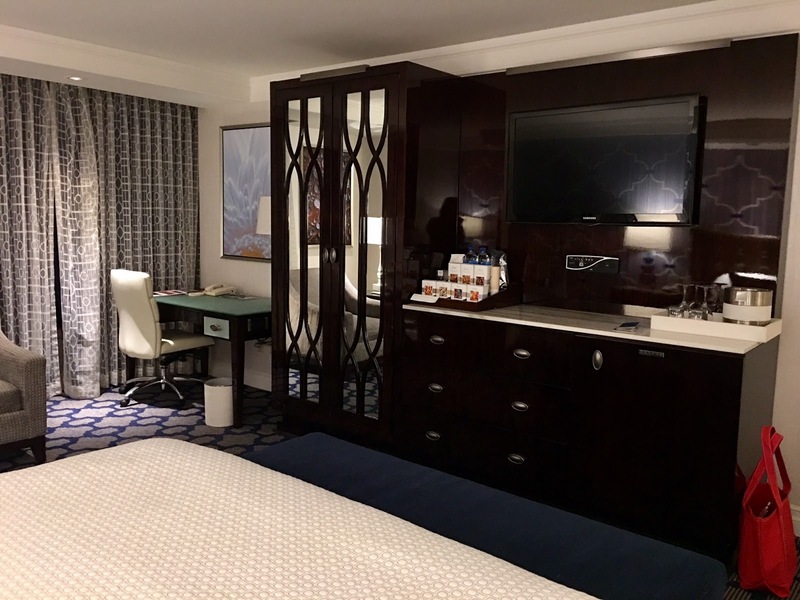 A hospitality study said Millennials carry around 2.8 electronics that need to be charged to hotels so it was lovely to see several outlets by the desk, both bedside tables including USB outlets. As for comfort, the bed was one of the most comfortable beds I've ever had the pleasure of sleeping on. That's probably one of my favorite things about hotels; the big, comfortable bed with crisp sheets and a wide selection of pillows, am I right? While I was initially disappointed that we didn't have a Strip view from our room, I ended up loving how beautiful our view was of their pool area. It even made it to my Instagram! Even at night, the glowing lights from the pool made it look romantic. 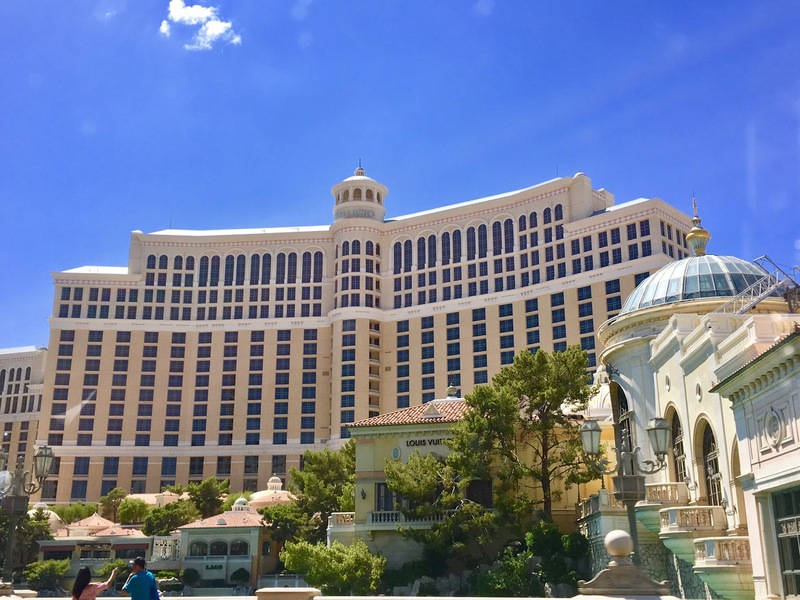 Dining at Bellagio: While there are a number of dining options at the Bellagio, below are four spots that I have dined at and enjoyed. 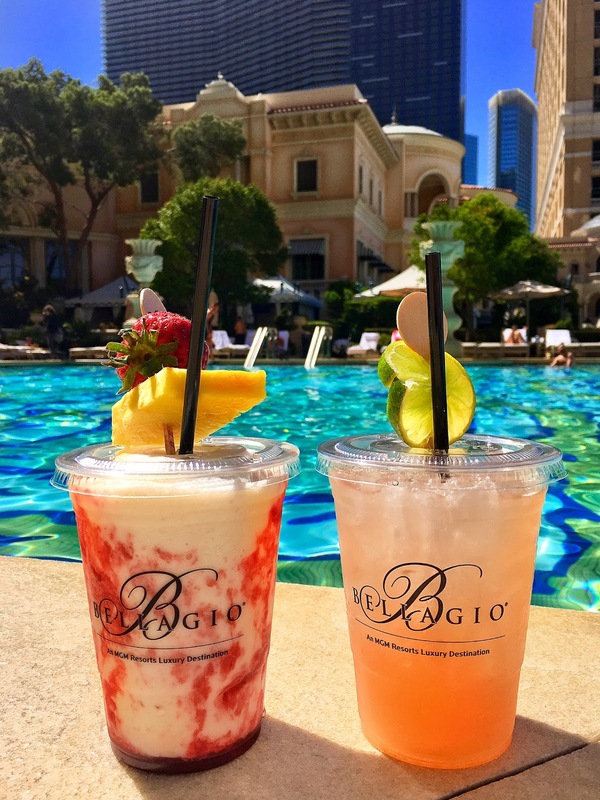 Click here to see the official list of dining options at the Bellagio. 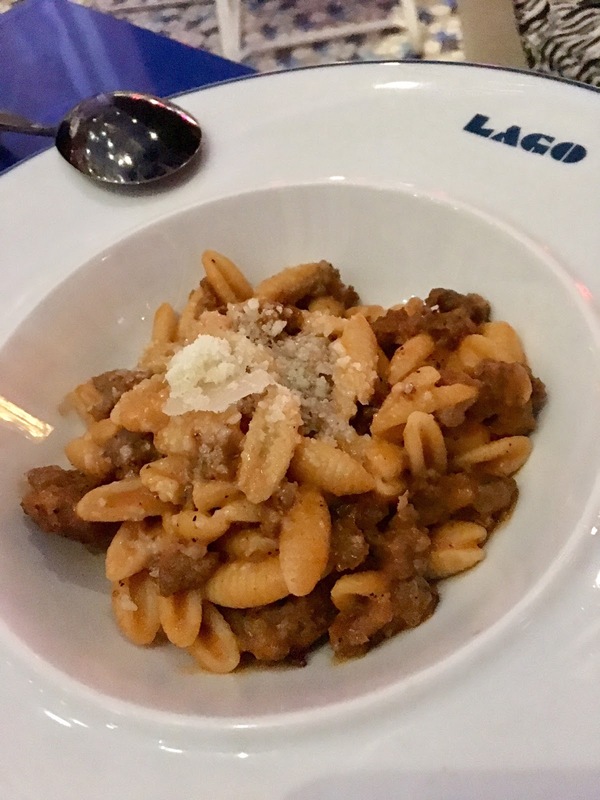 LAGO by Julian Serrano - If you want to dine with a beautiful view of the Bellagio fountains, this is a great option. While outdoor seating is limited, the indoor area by the windows are also a great spot. This Italian restaurant has both a restaurant and full bar depending on your mood. I made reservations for a special occasion and specifically requested outdoor seating with an unblocked view of the fountains. They were very accommodating and we were able to enjoy the water show every 15 minutes (every 15 minutes after 8PM). I think it helps if you're an M Life member and carry a status. The food was delicious but smaller portions than you'd expect. Fantastic cocktails and wine list. But who am I kidding, I went for the fountain view! Bellagio Buffet - Of all the buffets I've tried on the Strip (about 6), the Bellagio Buffet ranks in the top 3. They're open for breakfast, brunch, weekend brunch, dinner and gourmet dinner. They have a huge variety of dishes from different cuisines and a fabulous dessert selection. 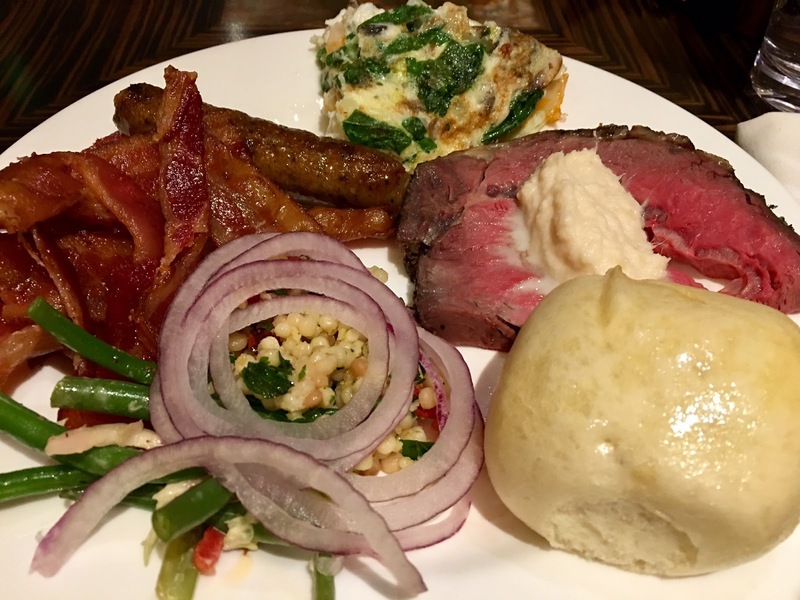 Custom omelette, prime rib, crab legs, sushi and so much more. Here's a friendly tip: get there around 30 minutes before brunch ends so you can enjoy the brunch food but the trick is, you get to enjoy dinner selections as well at the brunch pricing! You're welcome. Also! If you're a Pearl status or higher for M Life, you can skip the long lines. 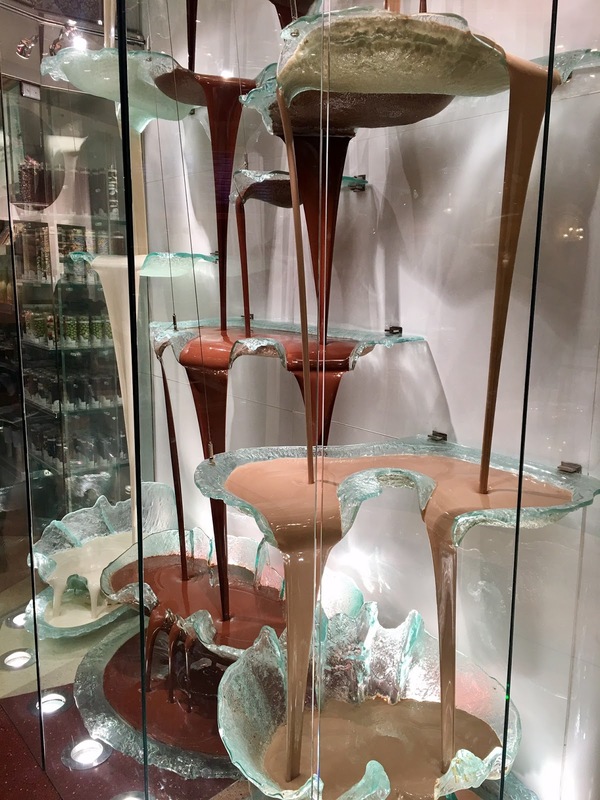 Jean Philippe Patisserie - One of my favorite places in all of Vegas. 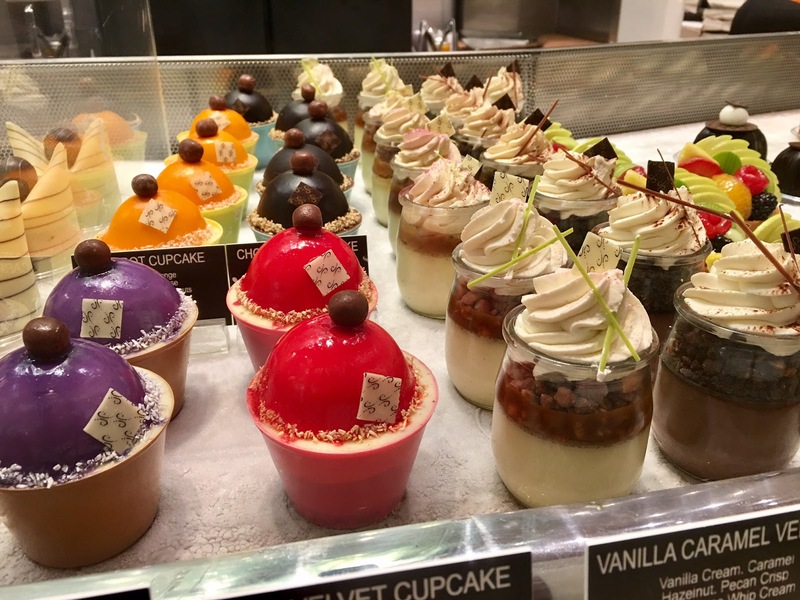 If you enjoy sweets and especially crepes, this is a place you must visit. The home of the largest chocolate fountain the world (yes, it's on the Guinness World Records), this quick-stop is a great place for a dessert that's open until midnight. 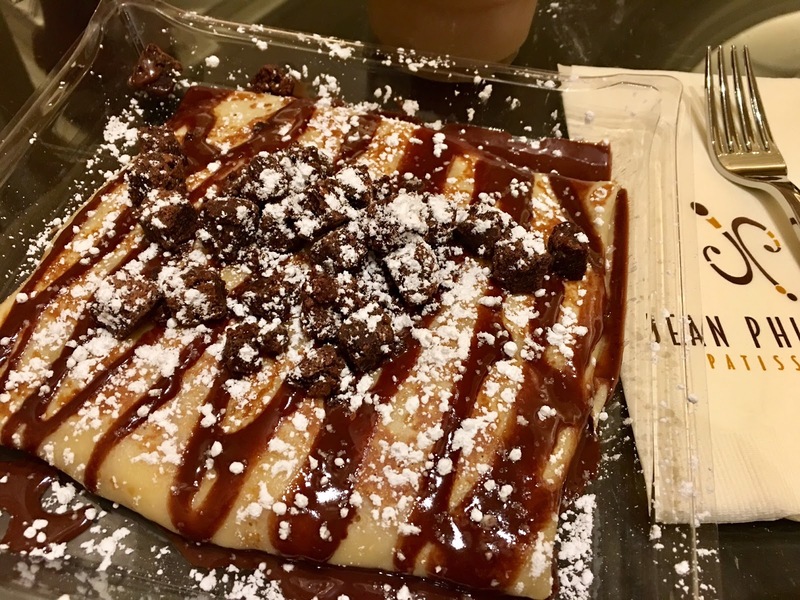 Just so you know, my favorite crepe is the Chocolate Souffle - trust me and try it! Noodles - I didn't even know this place existed as an option for Bellagio dining until we got lost trying to find the elevator. It was past midnight and we were hungry for some munchies so it was a pleasant discovery! As you can guess, their main dishes are noodles from several countries but the core is a Chinese restaurant. 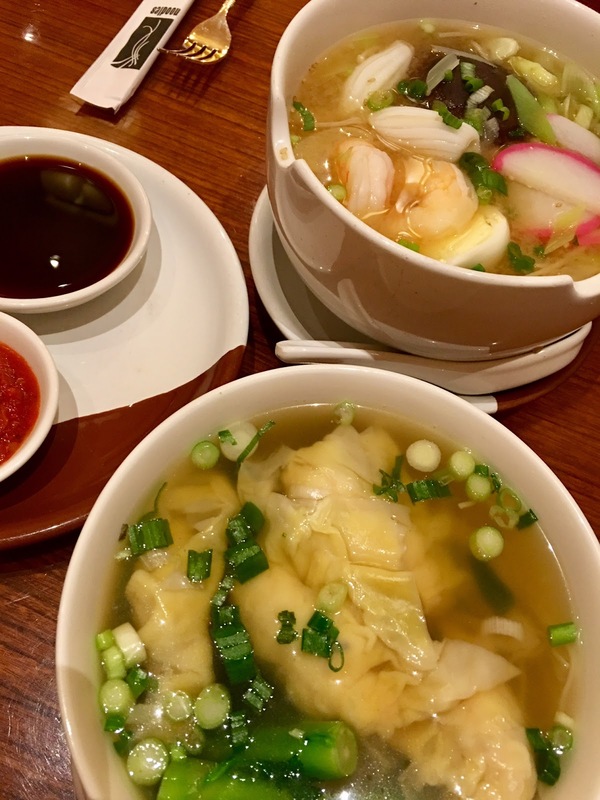 If you're not in the mood for noodles, they have a moderate selection of dim sum. I had the shrimp dumpling noodles and it was absolutely delicious! 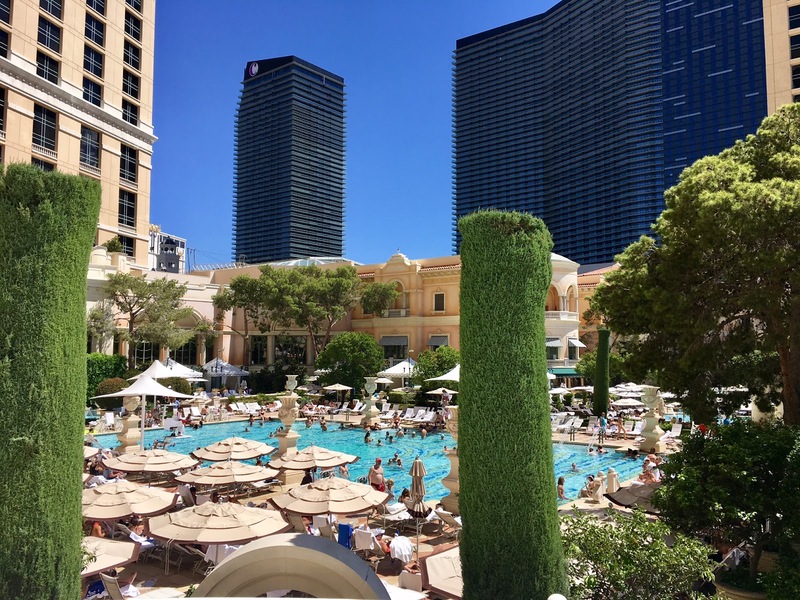 Pools at Bellagio: There's a lot of pool parties in Vegas and trust me, they're a lot of fun. But sometimes you just want to lay out by the pool and enjoy some frozen drinks, you know? 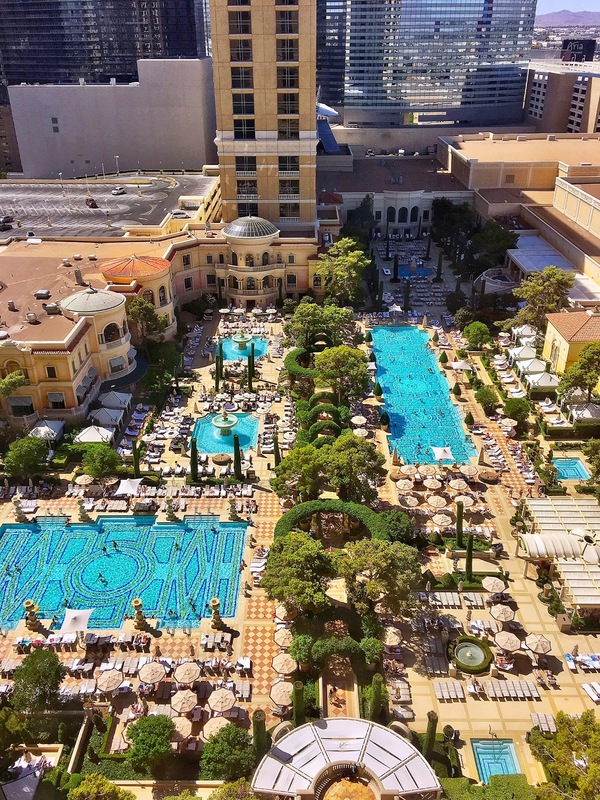 The Bellagio Pool has 5 distinct pools that all serve a different purpose (cold, warm, adults-only, etc). The absolutely stunning pool grounds also offers cabanas, daybeds, pool-side massages, drinks and food all for an additional charge. Hyde - Hyde at Bellagio is one of their two night clubs. It's over 10,000 sq ft including both indoor and outdoor spaces. Their outdoor space looks out towards the Bellagio fountains that makes for an amazing experience. One thing I noticed was an older crowd waiting in line, not the typical early 20's to early 30's that I'm used to seeing at clubs like Hakkasan, 1OAK, Marquee or Omnia. The Bank - The Bank at Bellagio is their premier, 5 diamond-rated night club. This upscale club has a strict dress code with stunning decor. Bellagio Casino: Obviously there's a lot of gambling opportunities at the Bellagio; it is Vegas after all. 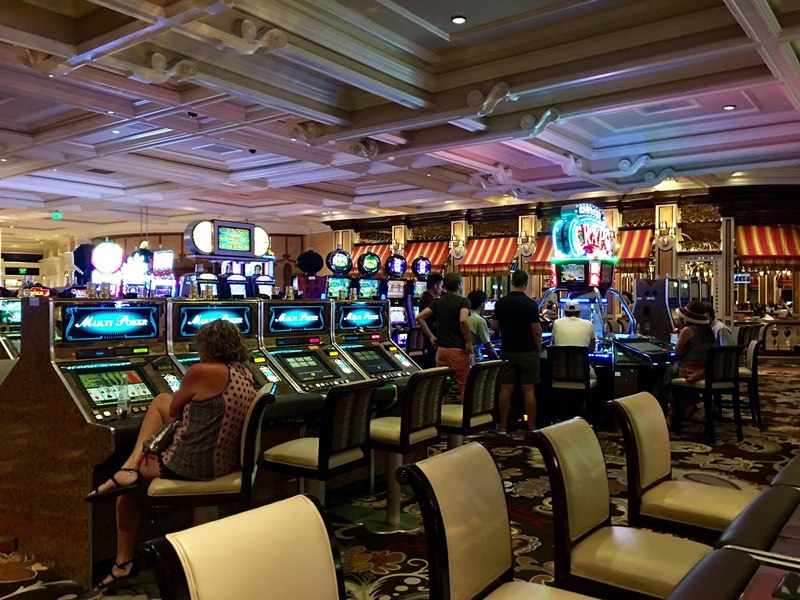 They have your typical tables, slots and high roller areas just like any other casino. The only difference I noticed is the minimums are higher at card and craps tables since Bellagio is considered a higher class casino. For example, there are $5 minimum tables at the Luxor but at the Bellagio, the lowest minimum I saw was $15. I'm like an old lady and love slot machines. I'm obsessed with the Deal or No Deal machine. During this stay, my $20 turned into over $300 so I was happy about that! "O" by Cirque Du Soleil - If you're a fan of Cirque du Soleil, you'll want to give "O" a chance. It's a water-based Cirque show and just as magical as the others. 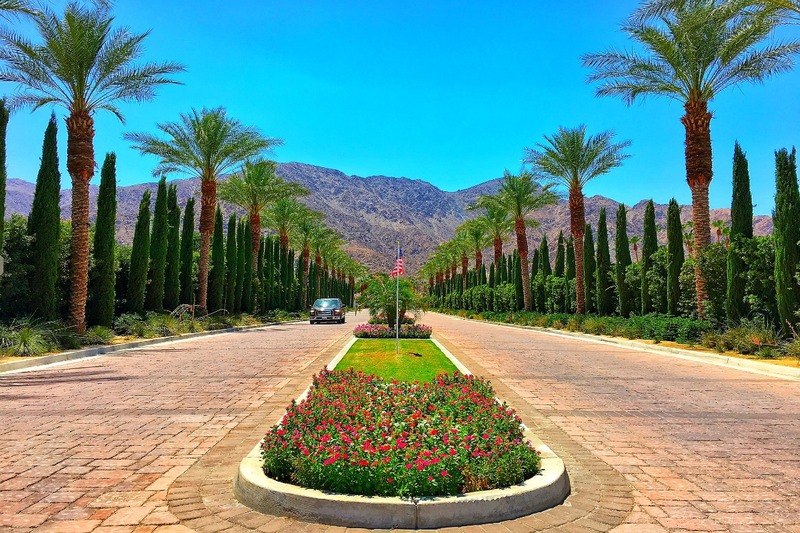 Gallery of Fine Art - The Bellagio Gallery of Fine Arts is an intimate exhibition space. 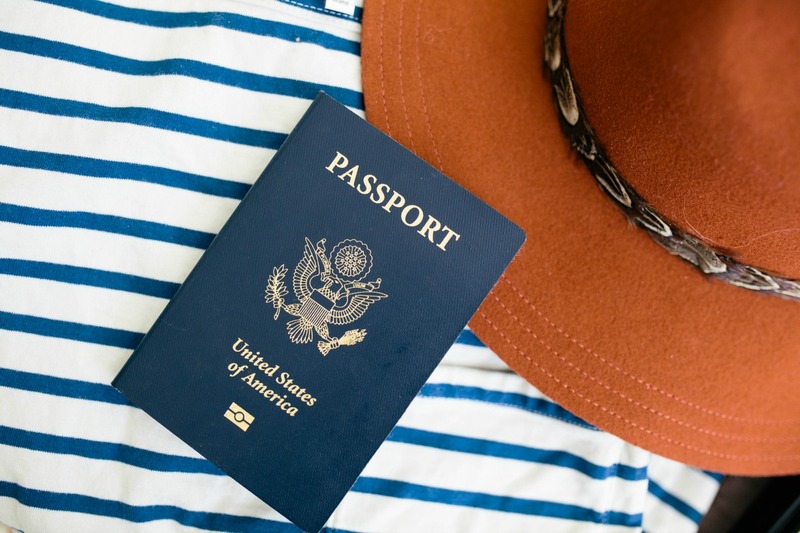 They say this is where "art goes on vacation". Their current exhibit (as of August 2017) is "I Am The Greatest: Muhammad Ali". Fountains of Bellagio - The famous Fountains of Bellagio is considered 'entertainment' on Bellagio's website. I can't argue with that since it's quite the show. It's mesmerizing and you find yourself awfully sad when it ends. During the day, it's every 30 minutes but once it hits 8PM, it's every 15 minutes. The best part? It's free! You make me want to go to Vegas so badly! Looks like the Bellagio did not disappoint one bit. The food is making me so hungry too! I enjoy anything Vegas related. Glad you had fun! I was salivating looking at the photo of the seafood buffet. Would you recommend The Bellagio as the go to Vegas hotel or do you have other favorites? Great review! Really makes me want to take off one weekend and go stay at the Bellagio too! And AMAZING food photos as usual. Yum! Thanks for all the tips and tricks! Yes, the Bellagio buffet is aweeeeesome! For a basic, 'I'm hungry so give me food' buffet, the Paris buffet is surprisingly good. Normally for EDC or other events, we just stay at the Luxor for a basic stay. Their buffet is definitely average but not bad at all! 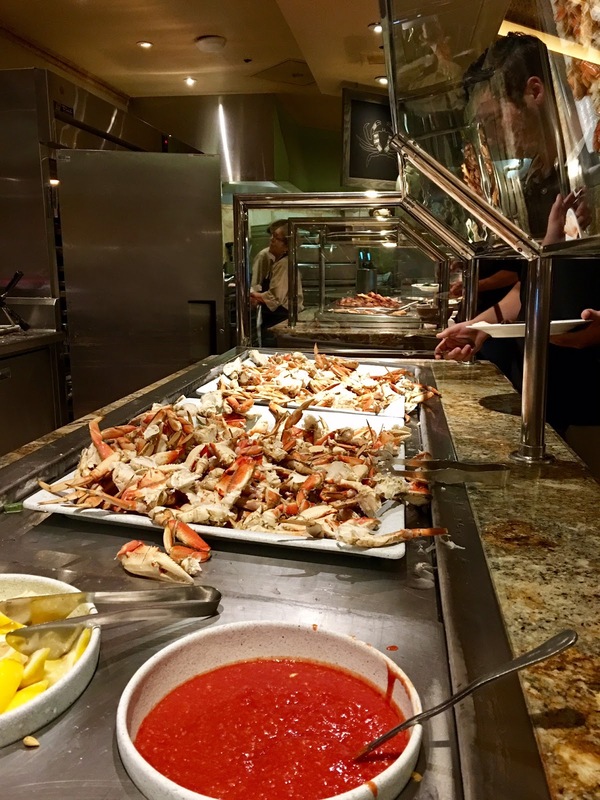 You had me at Crab legs and buffet! The rest is just bonus!! Looks amazing. I've never stayed at the Bellagio but it's such a fun hotel to hang out at. One of my favorites, actually. 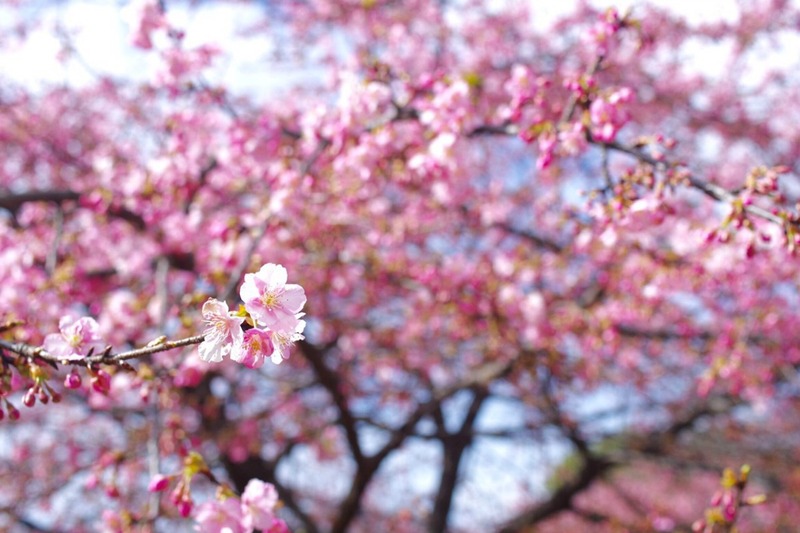 It's such a beautiful place. And that view over the pool looks pretty amazing! I have only seen the outside of the Bellagio but I'm sure the inside is beautiful. I remember watching the fountain show years ago and I was very impressed. That food looks unreal. I would seriously need to bring elasticized waisted pants to head here. The hotel looks lovely. Vegas is on my bucket list! 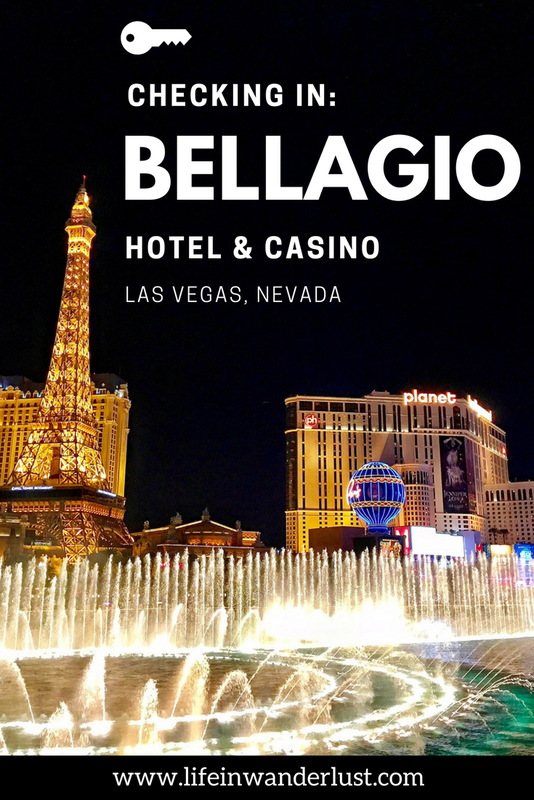 The Bellagio is definitely on my wanderlust Wishlist!